Today, April 22, is Earth Day! Every year on this day, we find ourselves reminded to celebrate the Earth and put Mother Nature at the forefront of our minds. Everyone at Ahh! Products is big on being eco-conscious whenever possible, at home and at our bean bag factory. Not recycling at the office is a huge no-no and no one here wants to get caught being too lazy to walk a soda can to the recycling bin! We also reuse most of our documents, because you can always right stuff on the back! The only times we don’t are when secure information is on them. Some of us even take it a step further and make paper airplanes and origami from paper that’s all filled up and can’t be written on anymore. Paper airplanes are always a good way to bring some humor to everyone’s day! We have someone here who even washes out plastic Ziploc bags when she can. We also care about being green when it comes to our bean bag chairs. Read about how AHH! 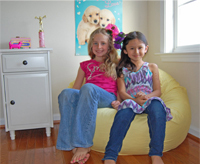 Bean Bags are Eco-Friendly and let's get excited about Earth Day today and all week long! So how can you and your family show your support for our planet, besides opt for eco-friendly bean bags from Ahh! Products? (Tee Hee!) Here are a few suggestions to make this a great week and heck, a great year and beyond for Mother Earth! Get your kids involved and teach them how important it is to care about our planet while they are still young! 1. Plant a tree, bush, vine, anything that will grow! If you don’t have much space, plant something in a pot. Try a flowering plant, something simple like daisies, in a pot in a sunny window or on the deck. I’ve even seen trees planted in pots on the deck. I’ve had good luck going to my local big box hardware store and nurseries and asking for plants that they may be about to throw away. I can then ask to take them for free. It’s always a great learning project for me and my daughter to nurse the plants back to good health. It’s like plant rescue! 2. Add herbs or a vegetable plant to your existing flower bed to add color, great smells, and something to good to eat! Or, try a fruiting vine or bush. I love blueberry bushes because you can trim them as small as you need to and given enough water and sunshine, you’ll get plenty of plump, juicy blueberries. My daughter loves to pick them and eat them right off the bush (I don’t use any sprays or chemicals on my blueberries). You can get blueberry, raspberry, and grape plants at your local big box hardware store like Home Depot. Grapes, I find, are hard to grow though due to disease and how crazy big they can grow. Herbs are always super easy and relatively pest-free for organic, chemical-free gardening. Please remember that if you are going to eat anything in the garden, do not spray anything harmful. That means if you have plants that you know you need to apply chemicals to (like roses), don’t plant edible plants anywhere near them! Daisies are super easy to grow and don’t normally require a lot of care, and they make great picked flowers for bouquets – so they are good plants to mix with edibles. 3. If you don't recycle, try it just for today. Extend it to the week. Get used to it and extend it forever! The typical American throws away about five pounds of trash a day, according to the Environmental Protection Agency. That adds up to about 200 million tons of American garbage a year! That’s MILLION, folks! And all that trash ends up in landfills. By the way, landfills also cause problems. Landfills are very unhealthy places. When rain or snow falls on them and then makes its way down into the garbage, they turn into a poisonous liquid called leachate. Leachate can pollute groundwater, streams, lakes and natural wells. So what does that mean to our drinking water?! 4. Take your kids to a botanical garden or park and get them excited about nature! You can most likely find a nature center in your town that will give guided tours, or self-guided tours to learn about the different plants and animals. If not, try contacting a local nursery and ask them if they could spare some time teaching your family about various plants, which ones are local and which ones are exotic, what they need to grow, etc. Then let your kids choose a plant to buy and take home – putting what they learned to work! I find that nursery staff love to talk about plants, especially to kids willing to learn. 5. Pack a picnic for your family. Then, go to the library or bookstore and get a book about nature, plants, animals, the planet, etc. Take turns reading from it while you munch on goodies on a blanket in the park. 6. Go to a local stream or creek and clean up the litter that’s most likely there. Wear gloves. This is a good family outing, but be careful with what the kids touch and pick up. No glass, metal, etc. I am a little paranoid, so I ask my daughter to point trash out to me and I go get it. You can also make a homemade trash pick with a tree branch that you sharpen on one end. It’s your call if you want your kids using it, though! Teach your kids that if they care about animals, they shouldn’t litter. Litter can kill wildlife. Cigarette butts and small plastic items are often mistaken for food and have been found in the stomachs of young birds and other animals. Litter also makes its way to waterways, where sea turtles and other marine creatures eat it or get caught in it (like nets or strings from balloons). Please don’t let balloons go, they can really hurt animals! 7. Attend a rally to show support. Or, go to earthday.org and see how you can make a difference. 9. Donate what you can to an eco-friendly organization. Find one at JustGive.org. Or, if you are feeling the urge to start something awesome, ask your neighborhood HOA or your kid’s school or your church to have a bake sale and donate the proceeds. Do this every year with your kids and start a fabulous tradition. Even if you can’t or don’t want to bake, there are so many goodies you can make and sell that are don’t require oven mitts: dip pretzel sticks in cake frosting and roll in colored sugar or cupcake confetti! Put a few in a paper cup and voila! – you’ve got super cute and yummy treats to sell. And inexpensive to make, too! 10. Gather all of your friends and throw an Earth Day party! Do a plant exchange: everyone brings a plant to trade. Use all eco-friendly, recyclable party supplies and recycle everything. Have everyone donate to a ‘We Love & Appreciate our Planet Earth’ jar and donate the proceeds to a green charity. Hold a raffle with prizes like pots of herbs or flowers and donate those proceeds to charity. Whatever you do, this is the time to remember how precious our environment is. Thank you to everyone that does their part! How do you celebrate Earth Day? What do you do year-round to support the planet?